Nexight Group helped the Kidney Health Initiative (KHI) develop an accelerated roadmap for the renal replacement therapy field to foster a new, multidisciplinary approach to advancing solutions that can improve the lives of millions of kidney patients with end stage renal disease. Chronic kidney disease affects about 10 percent of the population worldwide, including an estimated 1 in 7 adult Americans, yet methods for treating the disease—collectively referred to as renal replacement therapy (RRT)—have not changed significantly since the introduction of dialysis around 60 years ago. Additionally, current treatment options are time-consuming, are detrimental to patient well-being and quality of life, and have a significant economic impact on the United States, with Medicare treatment spending topping out at more than $90 billion annually. Recognizing the significant need for accelerated innovation and technology development in the RRT field, KHI committed to developing a technology roadmap to encourage innovative advances in RRT that could impact patients not only in the United States but also around the world. The Technology Roadmap for Innovative Approaches to Renal Replacement Therapy, published during the American Society of Nephrology (ASN)’s Kidney Week in October 2018, outlines strategies and research pathways needed to more effectively and efficiently develop commercially viable RRT alternatives to current dialysis treatments. 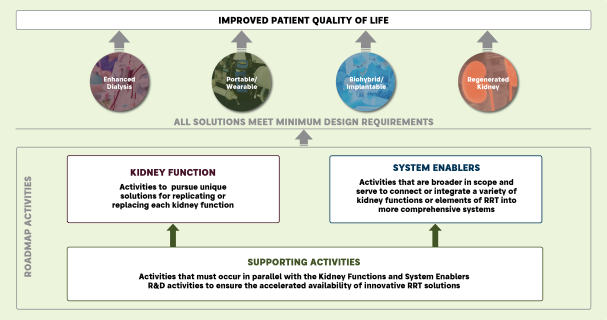 Welcomed and well received by the entire RRT community, the roadmap—including its patient-centered common design criteria for needed innovations—is already informing the efforts of forward-looking initiatives such as the Kidney Innovation Accelerator (KidneyX) prize competition.